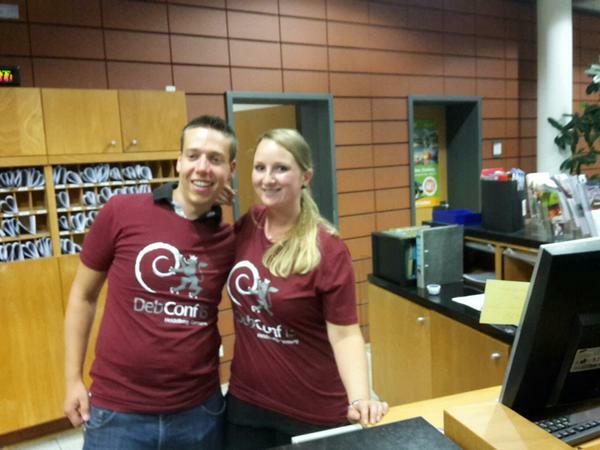 A week ago, we concluded our biggest DebConf ever! It was a huge success. We are overwhelmed by the positive feedback, for which we’re very grateful. We want to thank you all for participating in the talks; speakers and audience alike, in person or live over the global Internet — it wouldn’t be the fantastic DebConf experience without you! Many of our events were recorded and streamed live, and are now available for viewing, as are the slides and photos. Our very own designer Valessio Brito made a lovely video of impressions and images of the conference. We’re collecting impressions from attendees as well as links to press articles, including Linux Weekly News coverage of specific sessions of DebConf. If you find something not yet included, please help us by adding links to the wiki. We tried a few new ideas this year, including a larger number of invited and featured speakers than ever before. On the Open Weekend, some of our sponsors presented their career opportunities at our job fair, which was very well attended. And a diverse selection of entertainment options provided the necessary breaks and ample opportunity for socialising. On the last Friday, the Oscar-winning documentary “Citizenfour” was screened, with some introductory remarks by Jacob Appelbaum and a remote address by its director, Laura Poitras, and followed by a long Q&A session by Jacob. DebConf15 was also the first DebConf with organised childcare (including a Teckids workshop for kids of age 8-16), which our DPL Neil McGovern standardised for the future: “it’s a thing now,” he said. The participants used the week before the conference for intensive work, sprints and workshops, and throughout the main conference, significant progress was made on Debian and Free Software. Possibly the most visible was the endeavour to provide reproducible builds, but the planning of the next stable release “stretch” received no less attention. Groups like the Perl team, the diversity outreach programme and even DebConf organisation spent much time together discussing next steps and goals, and hundreds of commits were made to the archive, as well as bugs closed. 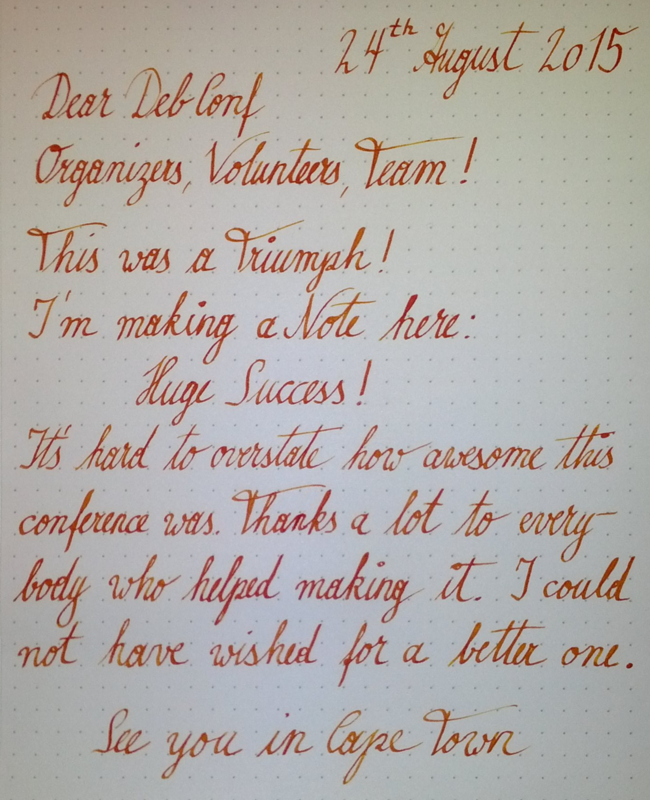 DebConf15 was an amazing conference, it brought together hundreds of people, some oldtimers as well as plenty of new contributors, and we all had a great time, learning and collaborating with each other, says Margarita Manterola of the organiser team, and continues: The whole team worked really hard, and we are all very satisfied with the outcome. Another organiser, Martin Krafft adds: We mainly provided the infrastructure and space. A lot of what happened during the two weeks was thanks to our attendees. And that’s what makes DebConf be DebConf. Our organisation was greatly supported by the staff of the conference venue, the Jugendherberge Heidelberg International, who didn’t take very long to identify with our diverse group, and who left no wishes untried. The venue itself was wonderfully spacious and never seemed too full as people spread naturally across the various conference rooms, the many open areas, the beergarden, the outside hacklabs and the lawn. The network installed specifically for our conference in collaboration with the nearby university, the neighbouring zoo, and the youth hostel provided us with a 1 Gbps upstream link, which we managed to almost saturate. The connection will stay in place, leaving the youth hostel as one with possibly the fastest Internet connection in the state. And the kitchen catered high-quality food to all attendees and their special requirements. Regional beer and wine, as well as local specialities, were provided at the bistro. DebConf exists to bring people together, which includes paying for travel, food and accomodation for people who could not otherwise attend. We would never have been able to achieve what we did without the support of our generous sponsors, especially our Platinum Sponsor Hewlett-Packard. Thank you very much. See you next year in Cape Town, South Africa!